Nearly halfway thru the summer season and so far it's been hot and dry, even by our standards. A few murmurs of El Nino in the Pacific -- we'll take a look at what, if anything, that means for us. I'm still alive! I took a couple months off after writing the seasonal wrap-up post. I used to do more frequent updates in the summer but found that I was repeating myself and there wasn't much to talk about. This past winter also took a toll on me psychologically and I needed a mental break from weather to recharge. Today is the 9th day of July. Meteorological Summer runs from June 1 to August 31, which means we are about a week shy of being halfway thru summer. Personally, I'm a winter guy and summer always goes the same for me. In May and early June, I really enjoy the warm weather. It's a nice change of pace to be able to get out and mountain bike, hike, golf, etc in the morning. Usually in May you can still ski too. My feelings on summer start to turn toward the end of June when the average high temperatures in the valleys exceed 90F and skiing is no longer an option. By this time of year, I'm already sick of summer and ready for Autumn to arrive and usher in cooler weather. I've learned to combat this by planning trips to cooler locations during this time of year. Just got back from the PNW and BC where the temperature never exceeded 80F and we frequently had light summer showers along the coast. Perfect! So far this summer has been hot, but not quite as hot as the previous 3 years. Mean temperature at the SLC airport since June 1 is 76.1F. That's at least 2 degrees cooler than the previous 3 years which were all tracking above 78 at this same point in the summer. However, it's still well above the 90-year mean which is in the low 70s. As for high temperatures, we are starting to settle in with highs each day of 90 or above, with our highest temp of 102 recorded on July 6. This is fairly typical. The next week looks to remain hot with temps continuing in the 90s. At least it doesn't look like we'll be in triple digits again for at least 10 days or so. If you're sick of the heat and wondering when it will start to cool off again, climatology suggests that Utah heat doesn't peak until the last week of July, then we start to gradually cool off thru the month of August. Not quite there yet! 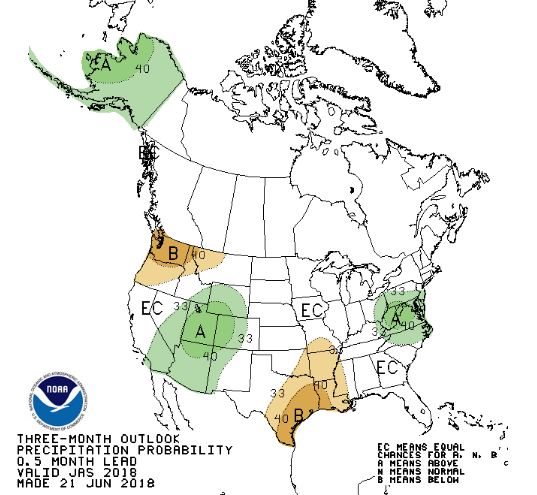 A bit of optimism from the CPC that we will get a good monsoon season. So far, it hasn't really developed in earnest, but it's still early. Looking beyond the rest of the summer.... You may be hearing rumors already of an El Nino season. 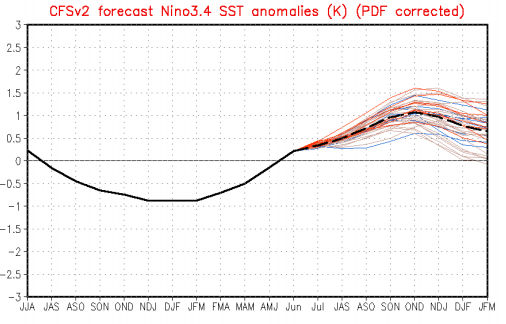 Right now the 3.4 region of the Pacific where they measure ENSO conditions shows warming in the direction of El Nino. 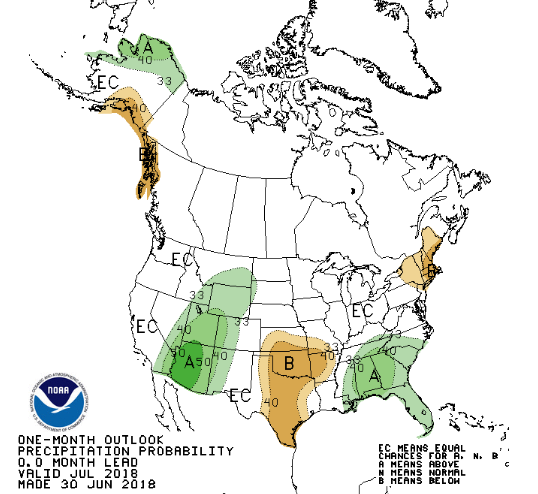 Currently NOAA is forecasting a 65% chance for El Nino conditions to develop this winter. 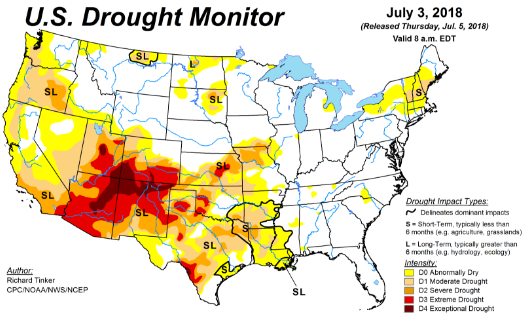 So yes, there is a general trend toward El Nino. 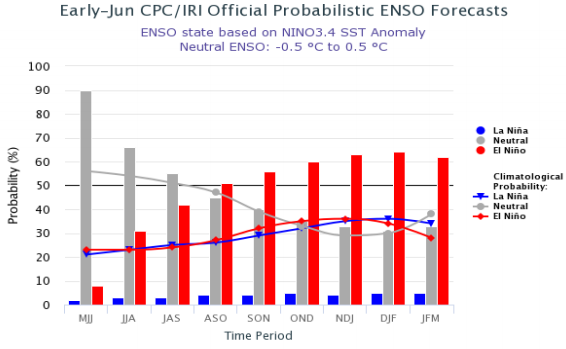 But, 1) It's early July and winter is months away and 2) ENSO doesn't correlate highly to Utah, so essentially El Nino/La Nina is meaningless. If I were you, I'd ignore the inevitable hype that ENSO status brings every Fall. To Evan, 'The Greatest Snow on Earth' is more than just a motto - it’s a way of life. In 2010, he started Wasatch Snow Forecast as a way to share the best powder days with his fellow snow-lovers. Evan brings the same quality forecasts and weather discussions to OpenSnow and hopes you enjoy skiing/riding Utah as much as he does.